Drug and alcohol abuse are not only costly and life-altering, they’re also oftentimes life-ending. Tens of thousands of Americans lose their life to overdoses each year, and many more continue to battle the addiction. Even a substance like alcohol, which is legal for consumption by adults in the United States, can be dangerous enough to take lives. Our facility is located in Grand Prairie, Texas, so we decided to look further into which counties across our state are hit hardest by drug and alcohol addictions, as well as those with relatively lower mortality rates. With Texas being a large state, there are over 250 counties included in our study. We found the drug- and alcohol-related mortalities rates for each county over the years from HealthData.org, as well as the percentage increase in each of those rates for each county. Shockingly, we found that drug use-related mortality across the entire state of Texas increased by 729% between 1980 and 2014. This is an incredibly troubling figure, with some individual counties showing an even higher rate of increase. When looking specifically at alcohol use-related deaths, the statewide rate decreased by 12% over the same period of time — a much more positive figure. The statewide figure of an 729% increase in mortality from drug use is startling, but it’s important to dig deeper to find out where that average comes from, especially for such a large state. The map above shows how neighboring counties have tended to experience similar trends in drug use-related mortality over time. 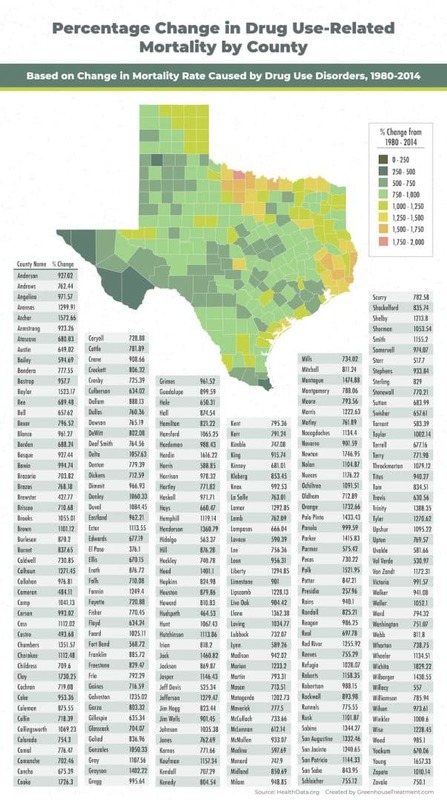 Those in the northeastern and eastern part of Texas have seen the largest increases (some over 1700%), while counties on the western end of the state have experienced smaller increases. Sadly, none in Texas have shown a decrease in drug use-related mortality over time. The counties with the largest increases are Wichita (1829%), Newton (1747%), Orange (1733%), Clay (1730%), and Cooke (1726%). 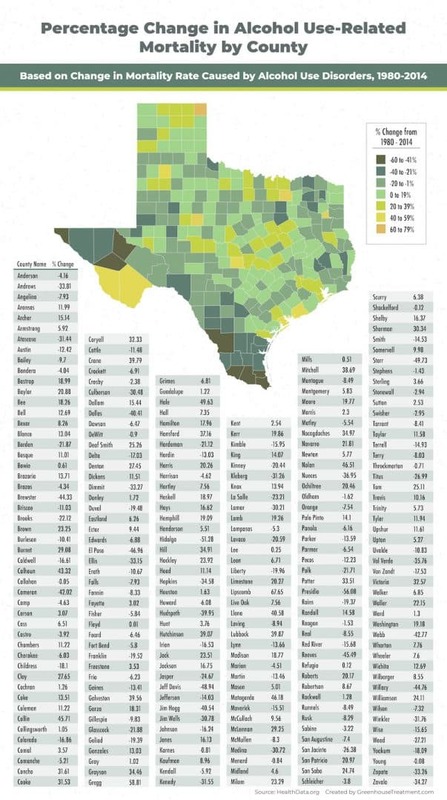 In all, 197 counties in Texas show a higher rate of increase than the statewide average (728%). Those with the smallest increase in drug use-related mortality are Presidio (258%), El Paso (376%), Brewster (428%), Hudspeth (465%), and Cameron (484%). 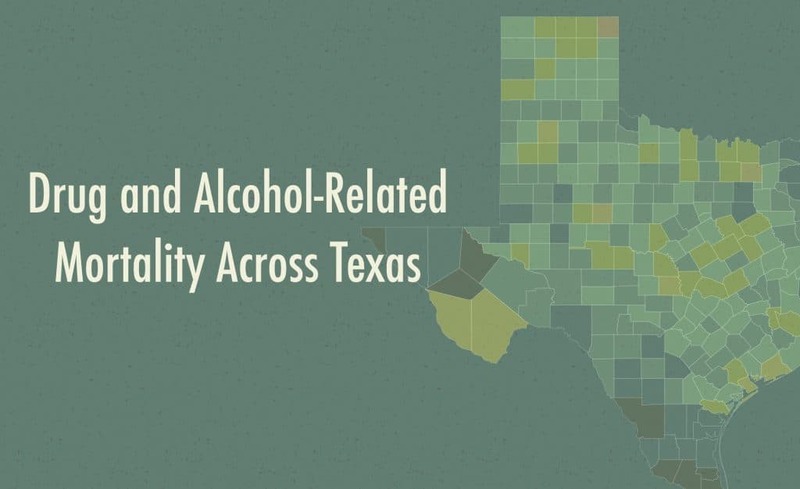 Similar to the discussion of statewide drug use figures, it’s also important to put Texas’ 12% decrease in alcohol-related mortality in context by digging into the county data. Sadly, many counties did, in fact, see alcohol use-related deaths go up over time. Interestingly, there is less of a geographic trend when looking at alcohol-related data than when we looked at drug-related numbers. 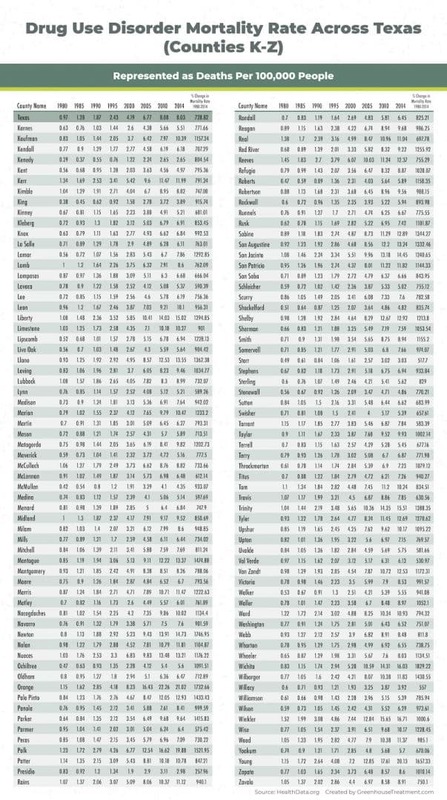 As it’s shown on the map above, the counties with the highest rate of increase are in various parts of the state, not just one or two areas. Furthermore, some areas that didn’t experience as much of an increase in drug-related mortality, such as the western section, did see a notable increase in alcohol-related deaths. The Texas counties that saw the largest rate of increase in alcohol-related mortality are Lipscomb (68%), Gregg (59%). Hale (50%), Nolan (47%), and Matagorda (46%). Overall, 186 counties saw a higher rate of increase than the statewide average (12%). Those with the smallest increase are Presidio (-56%), Hidalgo (-51%), Starr (-50%), Jeff Davis (-49%), El Paso (-47%). 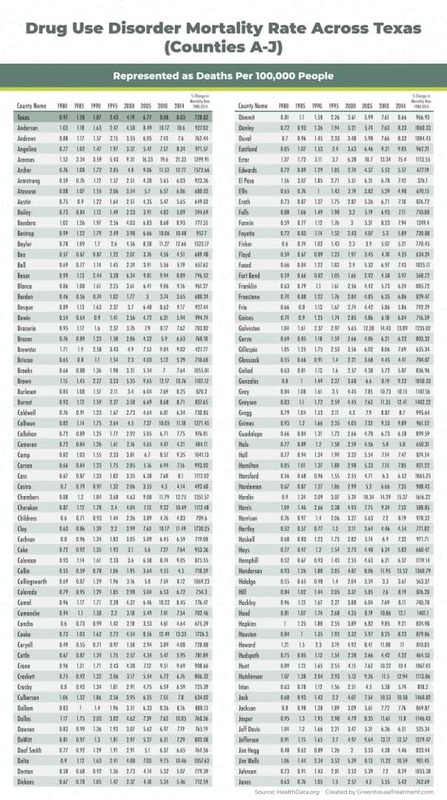 The rates of increase are important and are telling, but we also wanted to look at the specific mortality rates for each county by year. It could be the case that the mortality rate isn’t increasing significantly over time, yet still is a problematic and large figure. 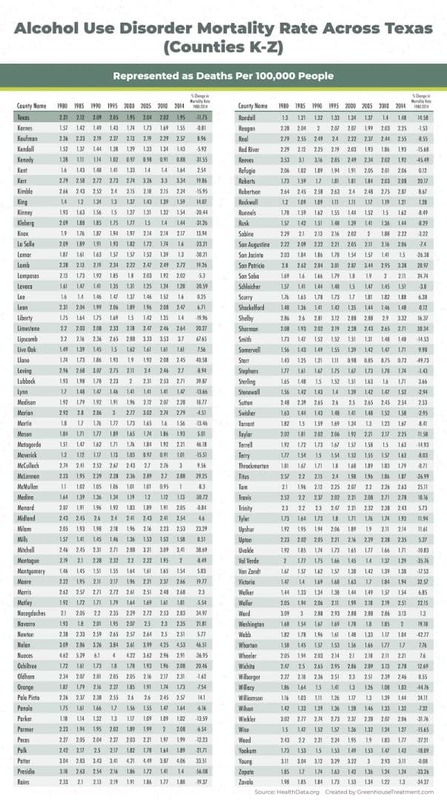 The statewide mortality rate is 8.0 deaths per 100,000 people (2014). The counties with the highest drug use-related mortality rates are Aransas (21.3), Orange (21.0), Young (20.1), Polk (19.9), and Winkler (16.7). Sadly, each of these five has seen an increase in mortality rate of 1000% or more since 1980. Those with the lowest rates are Kenedy (2.7), Presidio (3.0), Starr (3.0), Borden (3.7), and Hidalgo (3.7). Finally, we wanted to look at the specific mortality rates by county related to alcohol use deaths. Understandably, these rates are lower than those related to drug use, but are troubling nonetheless. 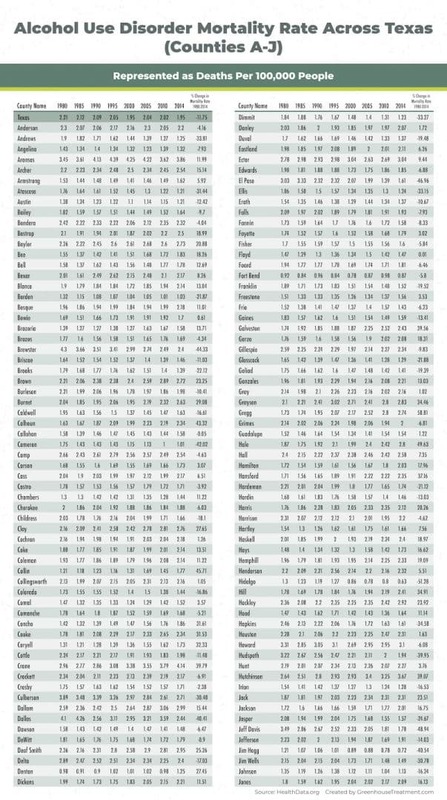 The statewide average is 2.0 deaths per 100,000 people (2014). The counties with the highest alcohol use-related mortality rates are Nolan (4.5), Crane (4.1), Potter (4.1), Aransas (3.9), and Lipscomb (3.7). Sadly, each of these five have experienced an increase in mortality of 12% or more since 1980. The counties with the lowest death rates are Hidalgo (0.6), Jim Hogg (0.7), Starr (0.7), Fort Bend (0.9), and Kenedy (0.9). It’s apparent from our analysis that a significant number of Texans are grappling with alcohol or drug use substance disorders, and that some counties are hit harder with related deaths than others. We hope that by sharing data like this, we can positively contribute to discussions that aim to solve these issues and help those in need. If you know anyone in your life who is suffering from an alcohol or drug addiction, find out more about how you can help.